On October 8, the USO’s CEO and President J.D. 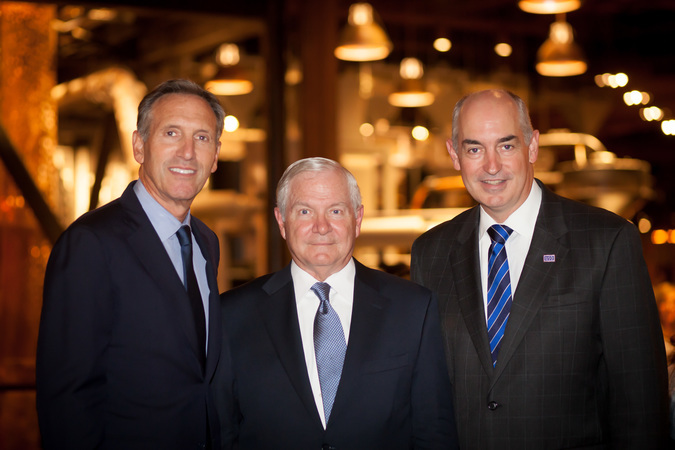 Crouch II joined government, nonprofit and corporate leaders at the Starbucks Support Center in Seattle. The purpose of The Muster—co-hosted by Starbucks and the Schultz Family Foundation—was to open a dialogue about how best to help transitioning veterans reintegrate into the civilian workforce and their communities. During the daylong event, Crouch screened the USO-produced video, “The Journey,” featuring service members and their experiences with the USO. He also participated in a discussion with former Washington Post reporter Rajiv Chandrasekaran—now Starbucks’ senior vice president for public affairs—which focused on not only transition topics, but also the military-civilian drift. The following is an abridged version of that conversation. Rajiv Chandrasekaran: It’s my pleasure to introduce J.D. 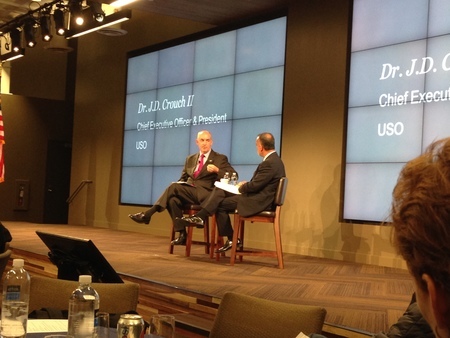 Crouch, the CEO and president of the USO. J.D., you’ve been president of the USO since the summer of 2014, coming to that job with both an extensive career in the private sector, but also a career of real public service, serving in our Pentagon as an assistant secretary of defense, and the White House as deputy national security advisor, as well as a U.S. ambassador. J.D. Crouch II: It’s great to be here. RC: Give us a sense of, what is the modern USO? You do such a range of things. Help us understand what today’s USO does. J.D. : First of all, thank you and thanks to Starbucks. I really wanted to begin [with “The Journey”] to give people a sense of some of the things the USO’s doing. If you think about our mission. That mission—at the highest level and at a very human level—can really be characterized in one word and that is connection. Military life is a life of separation. You put on the uniform, you’re not only physically separated from your family, your friends, your country, but you’re different. You don’t have the same legal system that’s governing you. You are asked to do things that have no [equivalent] analog in civilian life. What I think [President] Franklin Roosevelt understood in 1941, when he created the USO, is still true today. If you’re going to have an effective fighting force … it has to stay connected to the things that it’s fighting for. Obviously, what people could do and what people expected in 1941 versus what they would expect today [is different]. We run a satellite network that basically allows people all over the world … to be able to Skype home, phone home. One of my favorite services we have is called Skype Baby where you actually have a [service member] and his wife in the same room—virtually—during the birth of their children. We can’t make a difference everywhere, but where can the USO make a difference? Where we can really make a difference was around the million [service members] that will be transitioning out. Why? Because we’ve got access to them through the base structures. We have their trust and a very strong brand, and we have built up great partnerships over the years that we could then bring to bear and help to scale up. One of the challenges in this space … is how do we take the many, many points of goodness that are out there and scale them up so that we’re having an effective impact? In our own little way, we’re trying to do that with this new USO Transition 360 Alliance program. RC: Compared to previous generations, how does [the USO’s] work differ when you have a nation that doesn’t necessarily have a whole lot of skin in the game? The [military-civilian] divide, or our efforts, as we’ll talk about later, to bridge that divide, but how does that impact the work you’re doing? J.D. : We have about 600 employees all over the world and about 30,000 volunteers and those people are all in. They’ll go anywhere, do anything. So in a sense, it’s interesting, they’re sort of isolated from this divide. By the way, if I can just offer a thought, which is, we like “drift” or “disconnect.” Divide makes it sound like the rest of the 99 percent don’t like the military. The truth of the matter is, they hold the military in higher esteem than almost any one of our other institutions in the United States. What they lack is a sense of understanding. They may have sympathy, but they don’t have empathy. We see, as part of our mission … this bridging effort. If you go back to the founding document of the USO in ’41, it talks about being the connection between the American people and the men and women overseas. RC: ‘They may have sympathy, but they don’t have empathy.’ That’s worth underlining. How do we build a more empathetic nation toward service members and our veterans? J.D. : We need to consciously reach out. We need to consciously begin to connect people in our communities who have no connection to the military. We want to use our 75th anniversary … not as a celebration of the USO. We want to use that as a vehicle for raising awareness about what the military is and what it does. I think any opportunities we have to do that, we have to seize them. Rather than seeing us as … as one-way service delivery to men and women in uniform, we need to also see ourselves as a vehicle through which there’s an understanding built in the general public. That was true in 1941, but it was for different reasons. Today, it’s true because we have an all-volunteer force that’s 1 percent [of the population] and is, I think it was [former Defense Secretary Robert] Gates that said, becoming more and more enclaved. One of the challenges I see in that is that now we have more women in the military, which is a great thing, we’re finding that there are military families that are completely military. Again, that’s more enclaving. I think we need to find ways to … keep them as connected to the civilian life as possible. Show your support of our men and women in uniform by donating to the USO today. RC: Speaking of enclaving, the one factoid that really embodies that for me is the question of who’s the largest purveyor of gated communities in America? It’s the U.S. Army. So, you guys are getting really involved in the transition space through your Transition 360 initiative. Tell us a little bit about how you’re aiming to transform the USO, reimagine it so that successful transition becomes a key part of what you guys are going to be doing. J.D. : When we first started looking at this, in terms of what we thought the next mission was—this is after we had completed the two big facilities in the wounded warrior space—knock on wood, the number of severely wounded is going down, and let’s hope it continues to go down. We said, ‘What’s the next big thing for us, where we think we can help?’ We also wanted to maintain the sense that we really are focused on the active duty, Guard and Reserve. Stay focused on your core mission. In talking to the experts about transition, what we learned was there wasn’t enough transition going on. That is to say, there wasn’t enough time. That the planning process was too short. I think the military is beginning to correct some of these things, but people weren’t starting their transition early enough. We were thinking, we’ve got access. We’ve got the trust of this community. Is there something we can do there? So we really built the idea around sort of three areas for a service member and their family. One, have a plan to reintegrate into your community. Two, have a leg up. Be ready to be employed. Three, have a strong family—a lot of pressure has been put on these families—strengthening particularly the couples, but also the kids. It was a couple months later, I flew out and I saw Anne. I sat down, we talked … and I said, ‘I really want to make you a deal you can’t refuse. How do we scale what you’re doing up in this area across the country? Let’s partner together to do that. I’m very happy to tell you, by the end of the year, we will have five RP/6 sites set up at Fort Carson, Fort Campbell, Fort Hood, Norfolk, Virginia, and down in San Antonio, which are major military populations. We have a plan for at least eight more next year. The idea is to network those so people can move around and through them, and also to tie in our overseas centers. Not as RP/6 centers, but as you can begin your transition in Okinawa (Japan). You can begin your transition at Grafenwoehr (Germany). And we have a vision to build out that network so that in as many places we can possibly be, [service members will] be able to get those services and really help them get a leg up. RC: And you’ve got other partners on this, too, right? J.D. : Absolutely. Hire Heroes USA is our partner on the employment piece. Also, Stronger Families, which is another group that’s located up here in the Washington area. And The Comfort Crew for Military Kids is our kids’ support piece of this. One of the things we looked for—and a point that I wanted to bring forward on collaboration, because I think, I hope, that what we’re doing will encourage others to collaborate in this way, is look for organizations where you feel like the culture of that organization aligns with your culture. I’ve got a number of my team members out here. When they went [to RP/6], I think they felt like, ‘Man, this feels like a USO.’ And [RP/6] felt the same way. Culture is a really important thing. In some degrees, the programmatics and the strategy and the intellectual side of it are really important, but making sure that that cultural alignment is there is also critical. By the way, transition is not something that’s going to end. You know we talk about the million that are getting out in the next four years. Two hundred thousand get out of the military whether there’s a drawdown or not. That’s just normal. Military life is a constant transition. I think this is a problem that has legs, as they say. It’s a problem that we need to stay connected to and be supporting, because if we don’t, a generation from now, when that young person looks across the table and says to dad or mom, ‘Hey, you joined. You served. I’m thinking about serving.’ And if that mom or dad says, ‘I don’t know. I don’t think that’s such a good deal.’ Think about the implications of that for our country. RC: As we go forward, is there a challenge, a question, something—a call to action—that you would pose? I think that is absolutely the thing that is critically different between where we are today and where we were at the end of World War II or the end of Korea, where everybody had an idea. We have to change that. That will then sustain that sea of goodwill and it will also provide a much more, I think, welcoming environment for our military members as they transition back into civilian life.